We are writing this post to aware our users that there are lot of affordable options available in the market if you want to buy a big sensor digital camera, the camera listed below are not only affordable but will also give you better image quality than your pro compact camera and comes within the pro-compact price range. We always update this guide with time, the list of camera you see below are the best Mirrorless camera available $500 at 2018. We will update this guide in future also. Why Sony A6000 is better than the Sony A5100 ? The major difference between two model is continuous shooting speed, A5100 offers continuous shooting upto 6 frames per second and A6000 features 11 frames per second. Additionally you won’t get viewfinder and hot shoe. The price difference is only ($498-$448) = $50. Sony A6000 features very advance core specification and available under $500 price tag. The Sony A6000 features 179 point Phase AF Sensor and Continuous shooting speed of 11 frames per second. Which is even far better the Canon and Olympus. Why we have picked EOS M100 Mirrorless camera in the list. Since this camera features bigger sensor and more resolution than of Olympus E-M10 Mark II camera, and also the Auto Focus Speed of Canon M100 camera is very fast due to Dual Pixel CMOS AF Sensor. Canon EOS M100 can also record Full HD Video at 60 frames per second. Before we begin, we must told you the E-M10 II is a m4/3 format camera. The sensor of m4/3 small compared to the sensor used inside Sony A6000 and EOS M100. We are placing E-M10 Mark II camera in our list due to its 5 axis-IS support and advance core specs. A excellent tool under $500. This could be a serious competition between the two cameras one Olympus OM-D E-M10 II a complete newly born camera and its predecessor Olympus OM-D E-M10. This OM-D E-M10 II ‘s contribution is to extend the OM lineup and if we give a look at the specification table the major difference that we could see between the two is the implementation of 5-Axis image stabilization in the new one. However, this table shows nothing huge difference between the two as the same 16 mp resolution and the trade of same sensor. Both are having the low pass filter. Let’s talk the details of their differences. Olympus OM-D E-M10 II vs. Olympus OM-D E-M10 Specification Comparison Table. Sensor: The sensor of both the camera is almost same and features same resolution. However the Olympus E-M10 II camera features better base ISO range compared to the E-M10 camera. The E-M10 II will sure give your better color and contrast output when image captured at ISO 100 vs ISO 200 of E-M10. Image stabilization- Your shaky camera can’t harm your images anymore if you use OM-D E-M10 II because the engineering of 5-Axis IS help of which you will be delivered blur free images but on the other hand the old camera OM-D E-M10 has only 3-axis IS. So you could easily understand the difference. Shutter speed- Want to capture the fast running train or any sports actions then your shutter speed 60 sec 1/16000 sec of OM-D E-M10 II on the other hand the OM-D E-M10 has only 60sec 1/4000sec. Bit improvement in continuous shutter speed; The Olympus E-M10 II features 8.5 fps of continuous shooting speed on the other hand the E-M10 was limited to 8fps only. Display- The 3” OLED display of OM-D E-M10 II has the advantage that the color gamut is wider than that of an LCD display that allows more accurate reproduction of the colors of your images while these lacks are easily visible in LCD touchscreen of OM-D E-M10. Video: It’s a big disappointment for all those who are expecting 4K in Olympus E-M10, however we have told you few months ago that the upcoming camera will not carry any improvement in the video section. 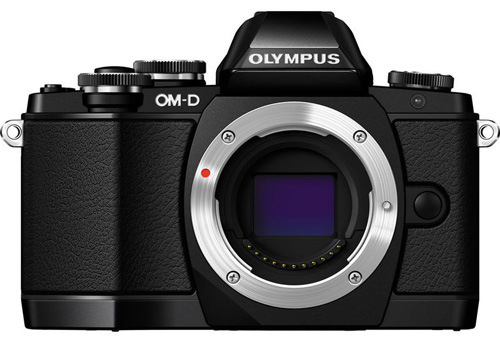 For current users The Olympus E-M10 did get incremental updates from Olympus but these updates are not enough for upgrading your E-M10 camera to E-M10 II. However If you are a new entry level user and willing to buy a entry level mirrorless camera then Olympus E-M10 II is highly recommended for you. 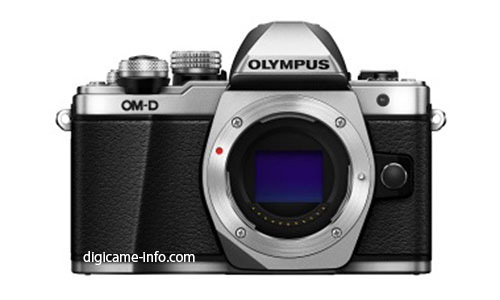 Some good news, the long rumored Olympus E-M10 is finally coming on End of August 2015. The camera will get a little upgrade over the core specification of current E-M10 camera. We have published the leaked images of the upcoming camera as well as expected core specification few weeks ago. The upcoming Olympus E-M10 camera will feature Mechanical as well as electronic shutter, in-short the camera will use Hybrid shutter technology that will sure boost its current shutter range [60 – 1/4000 ] to a next level [expected – 60 – 1/16000]. However the camera video recording capability will remain limited to Full HD mode. We have the consolidated financial reports of Olympus for the Q1 of the company’s fiscal year. 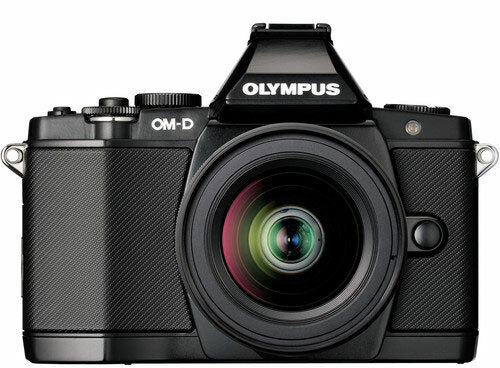 The report clearly declared that the Olympus has gained profit and showed its impressive market status due to the 25% growth in its sales of OM-D and Pen series cameras and also pushed its profit by the satisfactory growth of Imaging Systems Business with the increase of 12.3%. On comparing the Imaging business of Olympus with the same quarter of last year, It is clearly mentioned that it has booked a profit of 1.1 billion yen ( $8.8 million) . Last year the company had faced the loss of 1.9 billion yen ($15.2 million) at the same quarter. The magnificent sale of two of its products namely OM-D E-M5 II and its ‘Pro’ M.Zuiko lenses, gave few reasons to smile for Olympus. But the overall sale of Olympus is not satisfactory; its sales volume is decreasing @11% every year. So the company is trying to minimize the loss by surfacing the high-end compact camera models in place of its other low and mid models to gain more profit. We have selected some of the best lenses for Olympus E-M5 camera, Now the big question is why should you buy high quality or pricey lenses for your E-M5? Since your E-M5 comes with record breaking AF speed. The E-M5 uses FAST AF system (Frequency Acceleration Sensor Technology). The 16 Megapixel M4/3 sensor reads data at a rate of 240 frames-per-second and with the help of advance TruePic VI Image Processor the AF data quickly goes to lens AF motor and finally your lens should be of excellent quality to process the high speed data and acquire the AF as quickly as possible. 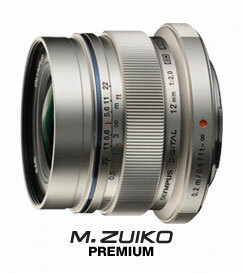 We are staring our lens recommendation guide with PRO lenses and later on we have also added Affordable lenses. The 75mm F1.8 is a high-grade portrait lens developed for professional shooters, the lens features very high-quality of optics and composed up-of 10 individual lens elements in 9 groups, including a total of 3 ED lenses and 2 HR lenses. Clear and sharp image quality starts from its largest f1.8 aperture, and a 9 blade aperture unit produces beautiful circular defocusing The lens built with a Movie and Still Compatible AF motor for silent auto focusing, close-up upto 29.5 inches is possible. Yes 12mm F2.0 is better than the M.Zuiko ED 9-18mm f4.0-5.6 lens, The 12mm supports F2.0 aperture range due to improved optics you get sharp results with better color and contrast. The lens also features “Silent focusing technology” that will help you to record still and video shooting. 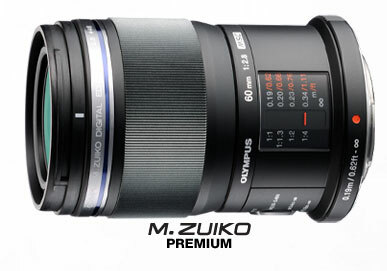 The only zoom lens available for the 75-300mm is the best compact and affordable zoom lens for your Olympus E-M10 mirrorless camera, the lens covers a long zoom range and comes at a affordable price point., on of the most important feature of Olympus 75-300mm lens is it features ZERO (Zuiko Extra-low Reflection Optical) lens coating, ensuring high imaging performance even under unfavorable conditions, for example when you have strong backlight behind your subject. The 45mm F1.8 Lens allow you to create a bit more smooth and creamy background compared to your 14-42mm kit zoom lens, the lens also features silent AF system that perfect for Video and Still shooting. 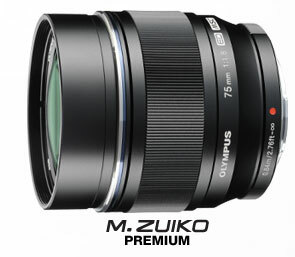 The only Macro lens made by Olympus for its mirrorless camera, the lens features closest focusing distance of 7.4 inch and has capability to capture subjects in 1:1 proportion, the lens is made up with 13 lens elements in 10 groups, the lens is composed with ED (Extra-low Dispersion), HR (High Refractive index) and E-HR (Extra-High Refractive index) elements to completely eliminate the chromatic aberrations that can be noticeable with telephoto macro lenses. The lens is compatible with Macro ring flash and also features MSC (Movie & Still Compatible) mechanism, which is based on a floating-type inner focusing system with three drive systems resulting in no change in the overall lens length during autofocusing. 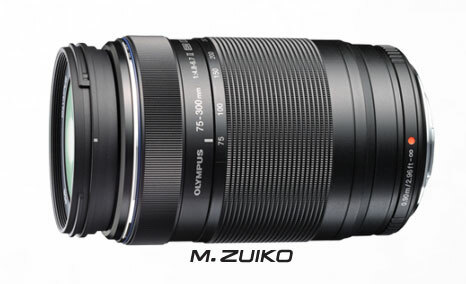 The 75-300mm is the best compact and affordable zoom lens for your Olympus E-M10 mirrorless camera, the lens covers a long zoom range and comes at a affordable price point., on of the most important feature of Olympus 75-300mm lens is it features ZERO (Zuiko Extra-low Reflection Optical) lens coating, ensuring high imaging performance even under unfavorable conditions, for example when you have strong backlight behind your subject. The long rumored Olympus E-M10 announced today, the camera features ultra compact body as stylus 1 compact camera and equipped with 16.1MP Live MOS Sensor with In-Body 3-Axis Image Stabilization that compensates for vertical and horizontal shifts (yaw and pitch) as well as camera shake along the optical axis (roll)., E-M10 speed performance is enhanced by use TruePic VII Image Processor and also captures Full HD 1080p Video Recording at 30 fps. On the rear side we have bright 1,440k-dot electronic viewfinder with an automatic eye-detect function, 0.007 sec. display lag time, and 1.15x magnification and we also have a a large 3.0″ 1,037k-dot tilting touchscreen LCD monitor, you can move it tilt 80° upward and 50° downward, useful while composing without moving our body while composing our shot. Other features include WiFi connectivity, the E-M10 also comes with a high quality collapsible 14-42mm F3.5-5.6 II R lens. CENTER VALLEY, Pa., January 29, 2014 — Olympus adds to its award-winning OM-D family with the new E-M10, an interchangeable lens camera that combines the outstanding image quality, speed and power of the flagship Olympus® OM-D E-M1 and the Olympus OM-D E-M5 into an extremely compact and stylish all-metal body. Featuring the new TruePic VII image processor, the same found in the OM-D E-M1, 16 megapixel Live MOS sensor, Wi-Fi® technology, a large, high-speed electronic viewfinder, 3-axis image stabilization, ultrafast autofocus and a built-in flash, it’s the OM-D for photographers looking for an affordable, yet powerful, system camera they can use every day. 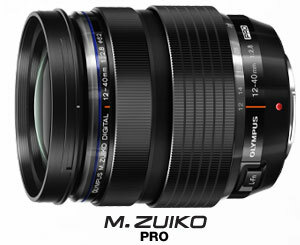 The new, super-slim M.ZUIKO® DIGITAL 14-42mm f 3.5-5.6 EZ pancake zoom lens and the super-bright M.ZUIKO DIGITAL 25mm f1.8 expands Olympus Micro Four Thirds line-up to 15 lenses. The Olympus OM-D E-M10’s 16-megapixel Live MOS sensor, combined with the TruePic VII image processor and M.ZUIKO lenses, delivers beautiful image quality with high resolution, superior color reproduction and high sensitivity that exceeds other cameras in its class. A maximum sensitivity of ISO 25600 is perfect for shooting dark scenes and indoor shooting locations, and ISO LOW mode (100 equivalent) expands the low-sensitivity end. The sensor’s rich dynamic range makes smooth gradations possible and beautifully depicts high-contrast highlights and shadows. Fine Detail Processing II technology configures the appropriate sharpness processing for each individual lens resulting in natural, high-quality resolution. The Olympus OM-D E-M10’s in-body 3-axis image stabilization system is derived from the world’s first 5-axis system in the E-M5 and E-M1. The 3-axis version effectively counteracts yaw, roll and pitch with both still shots and HD movies, regardless of the lens attached to the camera yielding great results even in poor lighting conditions or when using an exposure time of 1/15 second or less. The on-board FAST AF is Olympus’ fastest-ever AF system and uses 81 target areas that cover the whole image. Small AF Target and Super Spot AF modes make it possible to zoom in and focus accurately on minute sections of the frame. The E-M10 is also capable of capturing high-speed action with 8fps sequential shooting, the fast processor supports continuous capture of up to 20 RAW frames or an unlimited number of JPEG frames*, and the Continuous Auto Focus with Tracking mode accurately tracks and captures moving subject as fast as 3.5 fps. The ultra-slim, compact and lightweight Olympus OM-D E-M10 body is built with precision-machined metal parts and a premium feel that inspires the user. Two easy-to-reach metal dials give excellent operability and improved control, and the grip is designed to rest comfortably in the user’s hand. Despite its size, the E-M10 is the first OM-D with a built-in flash that is optimized for 1/250 second synchronization, a benefit for daytime flash photography. The large, 1,440,000-dot electronic high resolution viewfinder (EVF) located on the optical axis of the E-M10 features a 120-fps refresh rate, a 100 percent field of view and maximum 1.15x magnification to help accurately frame shots. An eye sensor seamlessly switches the display between the tilting, 3.0-inch touch-screen monitor and the electronic viewfinder. Camera setting information, such as shutter speed, is displayed at the bottom of the viewfinder and photographers can take full advantage of the EVF’s ability to display the effects of various exposure adjustments, Art Filter effects and Creative Controls like Color Creator, Image Aspect control, Highlight/Shadow control, Live Histogram, Display of five different grid patterns and even a Level Gauge — all without having to remove your eye from the viewfinder. New features, including Live Composite Mode and Photo & Movie Capture, expand the user’s creative potential. Live Composite Mode is a tool that offers previews of long exposures in the EVF, a perfect tool for anyone looking to easily capture light trails when shooting a star-filled sky. Photo & Movie Capture lets users shoot high-quality still images without interrupting the video recording. 12 Art Filters, three HDR capture modes and Photo Story support your photographic imagination. The Olympus OM-D E-M10 includes built-in Wi-Fi, and the setup is simple. By quickly scanning the QR code displayed on the camera’s LCD with a smart device, it syncs with the Wi-Fi network created by the camera. The free Olympus Image Share smartphone app synchronizes a user’s smartphone and E-M10 so the camera’s Live View is effectively displayed on the phone. In this way, the camera can be controlled by touching the smartphone display as if it were the camera itself, and users can send selected images directly to websites and social media. Olympus has also introduced two new Micro Four Thirds lenses to its line-up. The super-slim M.ZUIKO DIGITAL 14-42mm* f3.5-5.6 EZ pancake zoom lens measures just .9 inches thick, making it the world’s slimmest standard zoom lens. ** It has a smooth electric zoom that is suitable for shooting movies, and can also be zoomed in and out remotely using compatible smartphones through the updated Olympus Image Share app. 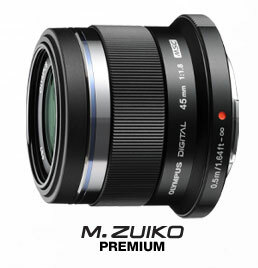 The super-bright, lightweight, high-performance M.ZUIKO DIGITAL 25mm* f1.8 lens has a fixed focal length and is ideal for capturing portraits or close-ups from as little as 9.8 inches away. Both new lenses are sold separately. A host of new Micro Four Thirds accessories join the Olympus Micro Four Thirds line-up, including the fixed-aperture F8.0 Fish Eye Body Cap lens with a focal length of 9mm (35mm equivalent: 18mm). It’s an ultra-slim accessory for creative wide-angle shooting through its 5-element, 4-group lens construction. The multi-use lens barrier MF lever switches from pan focus shooting to close up 8-inch shooting with a single press of the lever. The ECG-1 matching ergonomic grip is a removable grip exclusively for use with the E-M10. Designed for absolute comfort, the grip is the perfect thickness for resting the ring finger and pinky when holding the camera. A single press of the lever on the bottom of the grip easily removes it, making replacing batteries and memory cards seamless. The MCON-PO2 macro converter is compatible with six Olympus Micro Four Thirds lenses and adapts them for close-up shooting. Finally, the Automatic Opening Lens Cap LC-37C is available exclusively for use with the new M.ZUIKO DIGITAL ED 14-42mm F3.5-5.6 EZ. When the camera is turned off, this accessory protects the lens from dust and scratches, and when the camera is powered on the lens cap instantly opens for snapshots and quick shooting. **As of January 29, 2014. Shortest distance between the mount and the front end of the lens, when retracted. 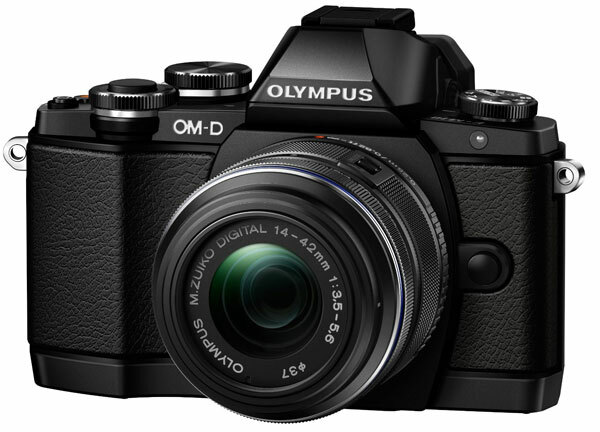 The Olympus OM-D E-M10 will be available in March 2014 in the following configurations.